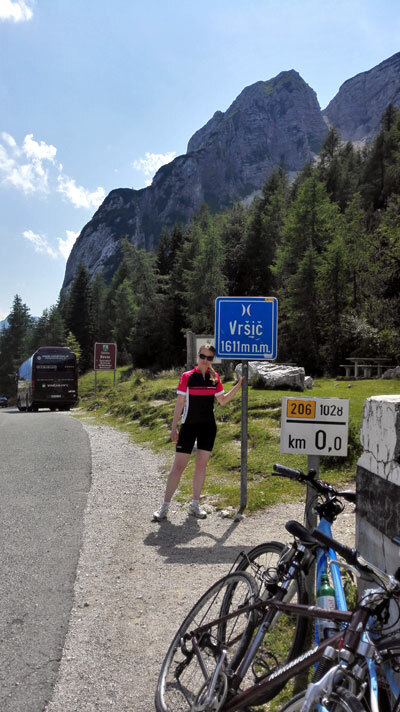 If you are a cycling enthusiast you need to go to Slovenia – the scenery is amazing and the weather is pretty good, most of the time. In spring, days are really warm, perfect for cycling. In summer it can get too hot but you can still do your rides early mornings and late afternoons, just so you avoid the worst heat. Slovenia is a hilly country with Alps in the north so there’s plenty of challenges for those who want them. I’ve just spent a week in Slovenia (my home country, just in case you didn’t know) and when I wasn’t having driving lessons, me and my fiance made use of a good weather to do some cycling. The second highlight for us was cycling to the top of the nearby hill, Kekec. The road to Kekec was steep and climb demanding. I was cycling in the lowest gear and pushing myself through the hardest parts until I conquered the top. It was intensive cycling but we were rewarded with beautiful views of Nova Gorica and Solkan (see below). Once we reached Kekec, we didn’t stop there. We continued on the narrow road up to get to the point where we left bikes and walked to Skabrijel, another hill nearby. The map above shows the cycling we did, excluding the hiking part. It may not look like we did a lot, but we did climb 345m and gradient was over 10% in many places and in one part it was even 20%! Now, that was a hard work! So we combined cycling and hiking together on that day and I think this really worked our muscles. For the next few days I could feel slight discomfort in my calves and I continued to feel the effect of these activities the following days. For this reason we didn’t set ourselves any more challenges, we just did some easy cycling on mostly flat roads and we didn’t take it far. Our muscles needed recovering and we could feel it. All in all I am really happy with all the activities we did in Slovenia. My legs feel much stronger now, I can feel it. Now I just have to continue to challenge myself to get even stronger and to build up my stamina. If you loved this post and would love to visit Slovenia one day, here is a good guide with 15 best places to visit when you are there. Where did you cycle lately? Have you ever cycled in Slovenia? I would love to hear about your experience. Wow! This looks like a brilliant trip! I would love cycling alongside that river! And well done on getting up that climb…it sounds tough but worth it! It’s so beautiful there Donna and tranquil, you should really visit Slovenia one day. Yes, I am really happy I managed to get on top of that hill! While spin classes did help me with my fitness, there’s no better way of improving your strength than by doing the real thing. This makes me want to get out on my bike! It looks lovely! Yes, it was such a great experience. I guess in the UK there are also some lovely places to cycle, the only problem is the weather.. So did you move to England a few years ago? If you did? Why would you want to leave such a love country?! I’d love to visit the mountains. Is it an expensive place to visit in terms of accommodation and transport? We have our own bikes in Slovenia which helps us to get around easily (without a car is otherwise a little bit difficult). Bikes can be put on a train (where allowed) and like this you can travel to different parts of Slovenia although the train connections are not that great. There are of course buses as well. Let me know if you have any more questions! Really great post! I work with electric bikes but have only just started cycling myself. I don’t think I’d be able to tackle the length of your journey but with such picturesque views I’d definitely be encouraged to keep going. I am glad you enjoyed the post Kate. 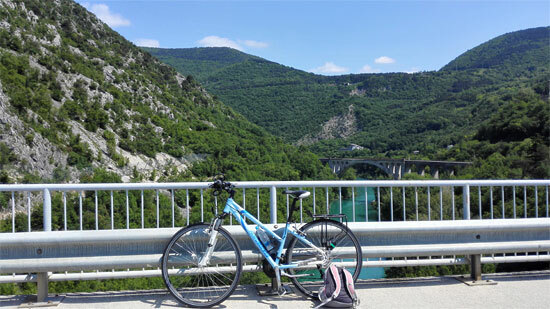 Slovenia is beautiful indeed but you don’t have to go for long cycling trips to experience its beauty. A short one will do as well!